I took my big glass, my Nikkor 14-24mm wide angle lens, with my Nikon D700 down to the beach at sunset yesterday. Unfortunately there weren’t enough clouds to provide a lot of drama (darn those clear New Mexico skies! 🙂 ) but I had fun shooting anyway. We weren’t the only ones on the beach. Caught this shot of a couple taking a stroll with their dog. Processed this one in Paint Shop Pro X9, using the Topaz Adjust plug-in. Wow, how long has it been since I’ve posted anything that I’ve shot with my Nikon? But that’s about to change. For those of you who don’t know, I’ve retired from work, and the hubby and I recently sold our house and almost everything we owned and we’re now living full-time in our 24′ Class C RV, traveling the country. We left our home in Tupelo, Mississippi on August 31, 2018, and we’re currently in New Mexico, making our way westward for the winter. We’ve finally started to get into somewhat of a groove or a routine, and so I *finally* got my Nikon 700 out of my camera bag today and did some shooting. This was primarily a day for getting reacquainted with my camera, trying to remember the very basics of aperture, shutter speed and ISO. I used my 28-300mm zoom lens since we were exploring and I wasn’t sure what to expect. 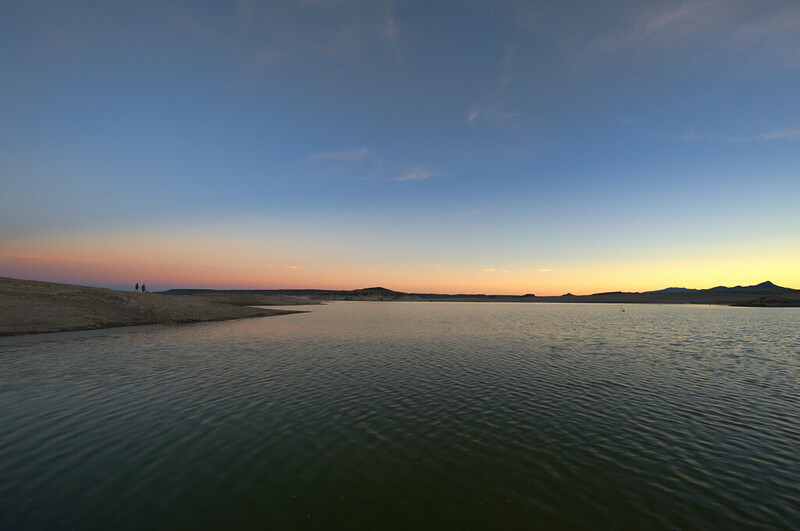 We’re currently staying at Elephant Butte Lake State Park near Truth or Consequences, New Mexico. 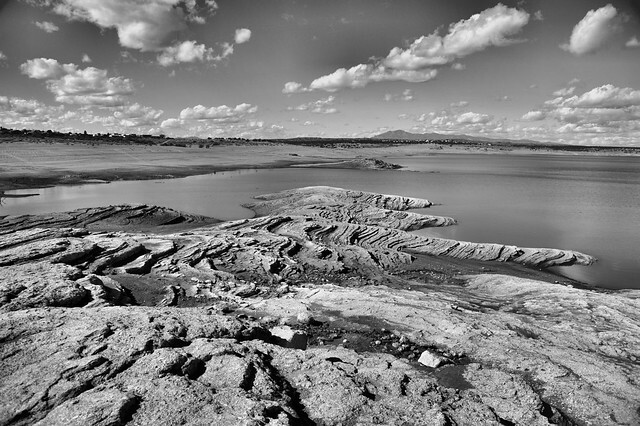 The lake is actually a reservoir, but due to the ongoing drought it is currently at about 4% of its capacity. 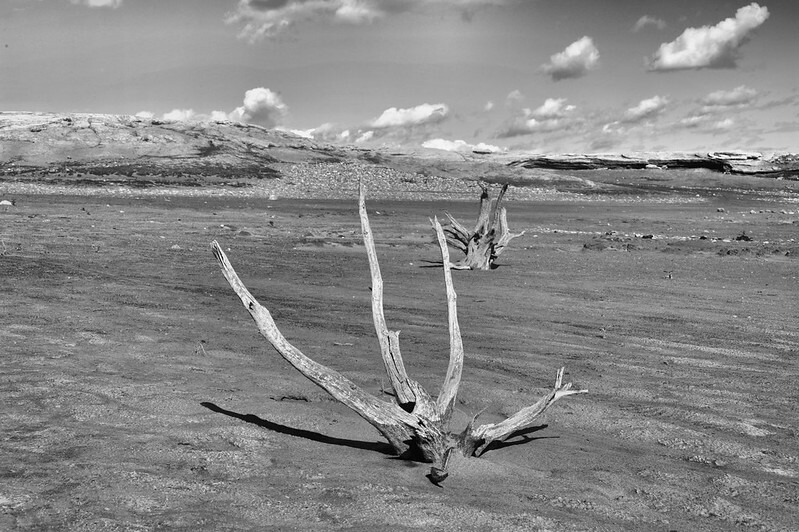 Therefore there is almost a Mad Max desolate feeling about the beach, although there is a lot of wildlife and the park is very popular with RVers and campers. We were hiking and shooting in the early afternoon when the sunlight was most severe, so after I looked at the results I decided to convert the shots to black and white. I have a real preference for B&W photography, especially for high-contrast images when there is no real interesting color in the shot anyway. This is one of my favorite shots from today. The ripples in the stone remind us that these rocks are supposed to be under water, but as long as the drought continues, they will be exposed to wind and rain instead. I’m looking forward to having much, much more time to spend on my photography, now that I am retired and living on the road. I love the Southwest USA, and look forward to capturing much of it through the lenses of my Nikon. I do still shoot a lot with my iPhone8+, and I post a curated series of those shots to Instagram at Instagram.com/zen_of_zann. I also post iPhone shots related to our RV travels to Instagram.com/JustCallUsNomads. Feel free to follow both those feeds if you’re interested! Shot with iPhone 8 Plus in my backyard.